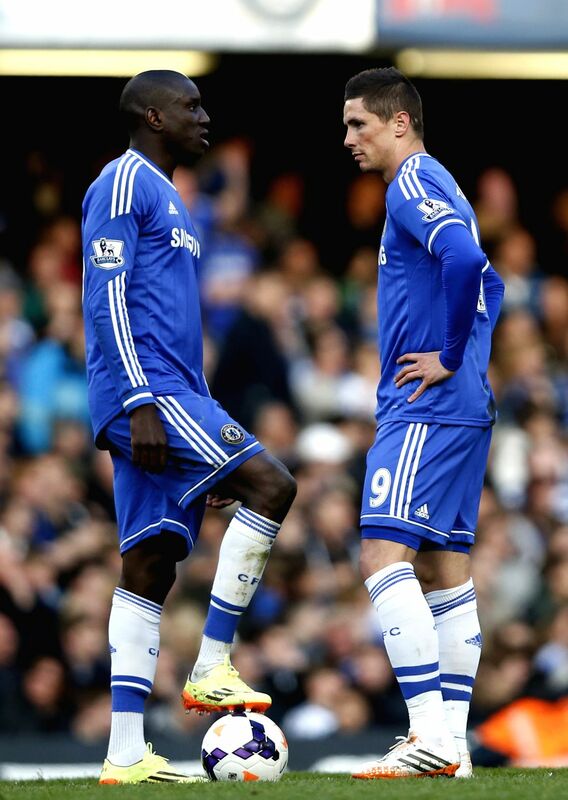 LONDON, April 20, 2014 - Demba Ba and Fernando Torres (R) of Chelsea look dejected after Sunderland scores second goal during the Barclays Premier League match between Chelsea and Sunderland at Stamford Stadium in London, Britain, on April 19, 2014. Chelsea lost 1-2. (Photo: Xinhua/Wang Lili/IANS) . Oscar(C) of Chelsea vies with John O'Shea (L) of Sunderland during the Barclays Premier League match between Chelsea and Sunderland at Stamford Stadium in London, Britain, on April 19, 2014. Chelsea lost 1-2. (Photo: Xinhua/Wang Lili/IANS) . 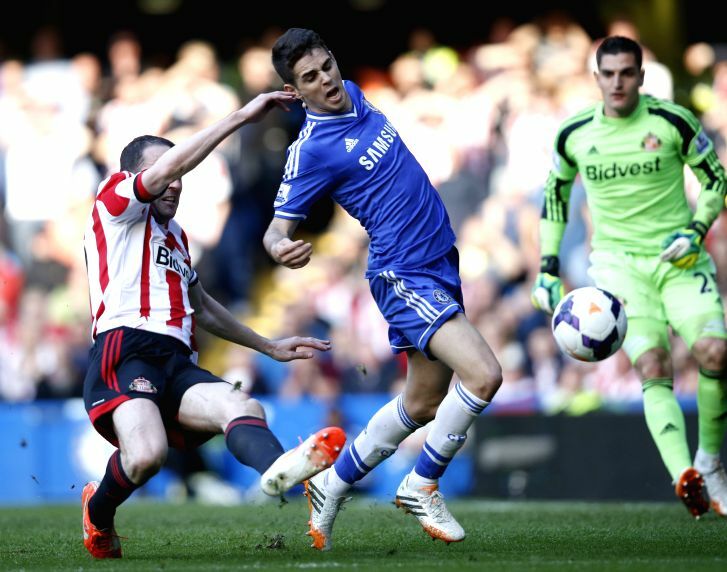 Oscar(L) of Chelsea vies with Lee Cattermole of Sunderland during the Barclays Premier League match between Chelsea and Sunderland at Stamford Stadium in London, Britain, on April 19, 2014. Chelsea lost 1-2. (Photo: Xinhua/Wang Lili/IANS) . 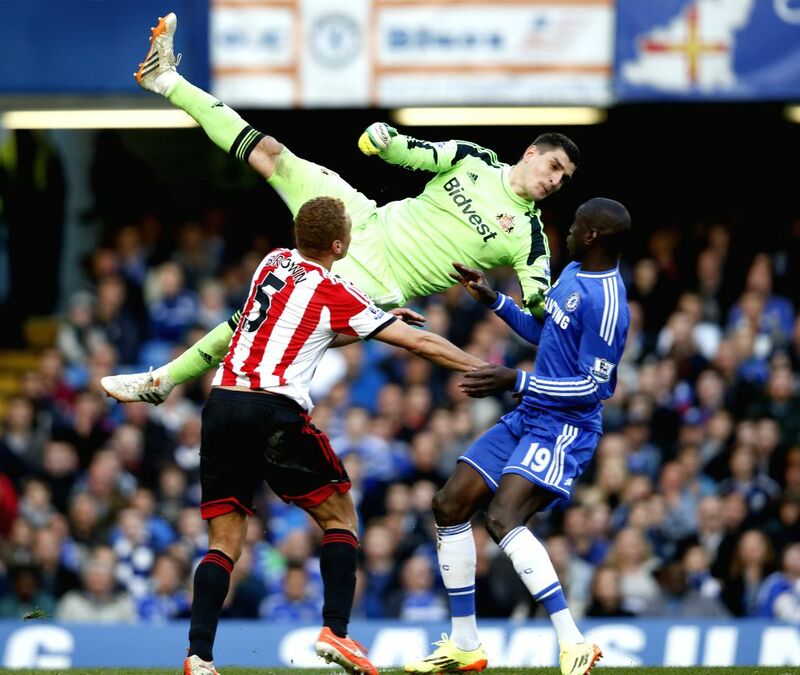 Vito Mannone, goalie of Sunderland, falls injured after jumping for the ball during the Barclays Premier League match between Chelsea and Sunderland at Stamford Stadium in London, Britain, on April 19, 2014. Chelsea lost 1-2. (Photo: Xinhua/Wang Lili/IANS) . Branislav Ivanovic (L) of Chelsea vies with Connor Wickham of Sunderland during the Barclays Premier League match between Chelsea and Sunderland at Stamford Stadium in London, Britain, on April 19, 2014. Chelsea lost 1-2. 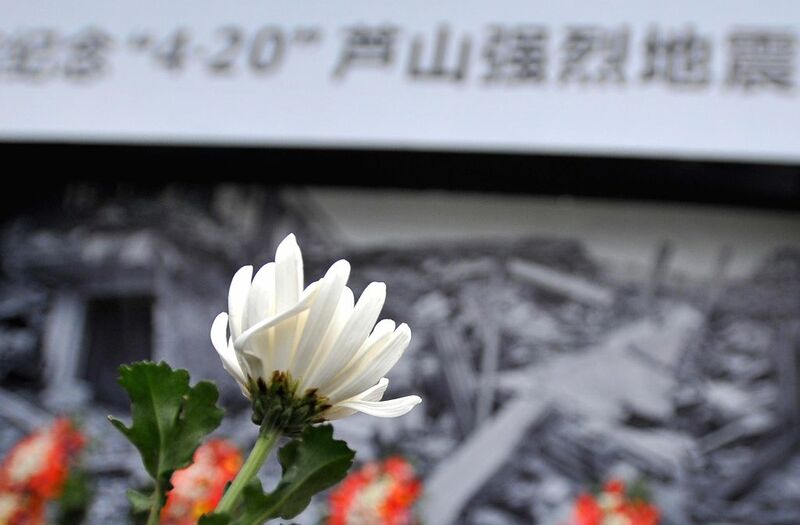 (Photo: Xinhua/Wang Lili/IANS) .